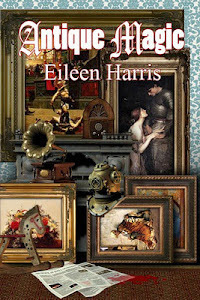 Antique dealer Alicia Trent is hired to appraise a huge collection of treasures hoarded by a woman who has recently died in the town where Alicia grew up. The huge old house poses mystery after mystery from the moment she arrives, but the stakes become deadly when murder is added to the mix. The question then becomes, can she stay alive long enough to unmask the killer? Antique Magic, is the first in a series about Alicia Trent. She owns an antique store in Scottsdale, Arizona, and has a knack of getting involved with mystery and murder in fascinating environments. Occasionally a little magic occurs. Ali is in the antique business. The opportunity to finally be able to go through Mrs. Halls stacks and stacks of antiques arises after Mrs. Halls death. Ali’s excited and gets straight to work sorting and pricing the antiques. In the process she tries to find out why Mrs. Hall collected so much. Instead what she stumbles upon might mean Mrs. Hall could have been murdered. This was a fun book to read and I can honestly say the author kept my guessing who the bad guy was. I was happily surprised when I found out. From living off the grid in the Arizona desert, Eileen has moved to the woods of upstate New York. She has authored a standalone adventure novel called Desert Shadow. She is also the author of Alicia Trent Series. The Black Cane : Dowager Diaries Book 1 is her latest release.